1990 Establishment of the Belarussian Research and Practical Thyroid Tumor Centre in order to develop medical treatment for the victims of radiation exposure after the Chemobyl accident and for the research of radiation- induced thyroid cancer. lymphodissection for radiation-induced thyroid cancer. Dr. Demidchik is a well-known and world-famous thyroid surgeon, who has devoted himself for a long time to patients with thyroid cancer, especially children after the Chernobyl Nuclear Plant Accident and even during the critical period of the catastrophe in the former USSR. 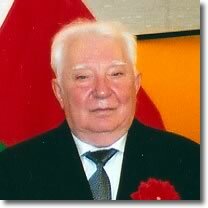 He has contributed a lot to establishing the Minsk Thyroid Cancer Center in the Republic of Belarus. Dr. Demidchik has fIrst reported the rapid increase of childhood thyroid cancer in the international scientific joumal, NATURE, in 1992 and coordinated many international projects on Chemobyl Thyroid Cancer, these achievements have been highly evaluated in the world. More specifically, he has introduced and maintained successfully radioisotope therapy, I-131 , to patients with operated childhood thyroid cancer. Dr. Demidchik is of novel character and highly respected. He is now 76 years-old but still supervises actively in the frontline of thyroid surgery for radiation-exposed patients. Therefore, Dr. Demidchik has been highly evaluated as the most suitable winner for the 4th Annual Nagasaki Dr. Nagai Peace Memorial Prize.